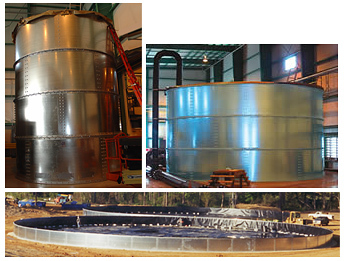 Bolted steel ModuStor tanks, available in a wide range of sizes and capacities, from a few thousand to millions of gallons, are ideal solutions for water storage and most liquid containment needs. Factory fabricated modular components designed for rapid bolt-together assembly by workers using common hand tools, drop-in liners, minimal site prep. Furthermore, the ModuStor’s bolted construction allows quick disassembly for relocation to a new site. A full range of factory-fabricated drop-in liners is available in a variety of thicknesses. Some large liners may require field seaming. Heavy-duty reinforced industrial grade liners, suitable for water and most chemical storage needs, include XR-5, polypropylene and polyethylene. ModuStor tanks can be erected on any firm level gravel, compacted earth, concrete, or macadam surface. ModuStor anchor plate and above-ground ballast system eliminates the need for guy wires and concrete footings, a preferred system for short term projects or where concrete footings or other ground penetrations are undesirable. ModuStor tanks can also be anchor bolted to concrete ring foundations for permanent installations or used free-standing in wind-free indoor locations. Floating covers are fabricated from reinforced liner materials. They ride on the fluid’s surface, buoyed by attached flotation logs and fastened to the ModuStor with gaskets and steel battens forming a practically vapor-tight seal. Stainless or galvanized steel covers with optional hatches, vents and flange fittings are available for smaller ModuStors. Modustor tanks can be fitted with either internal or external insulation. Photo is of externally insulated Modustor. Modutanks can be fitted with double liners for secondary containment. Inlet and outlet pipes can be installed over-the-top, through-the-bottom or through-the-wall or cover with flange fittings in factory cut holes. Flange fittings, sight glass leak detectors, hatches, ladders, vents, vortex eliminators, leak detection, baffles and adjustable standpipes are available. Input, output and level equalization piping can be attached to ModuStor tanks by bottom or through-the-wall connections or over the top. Wall openings can be precut at the factory. Wall panels are G-90 mill galvanized or cor-ten steel sheets of varying thicknesses from 16 ga. to 3/16″ in multiple layers. Girths are hot dip galvanized 3″ x 3″ structural steel angle. Anchor plates are 3/16″ thick cor-ten steel. Anchor brackets are hot dip galvanized 3/8″ thick steel angle. Fasteners are grade 5 plated or galvanized steel. Eight ounce geotextile liner underlay is included.